The First & Original! 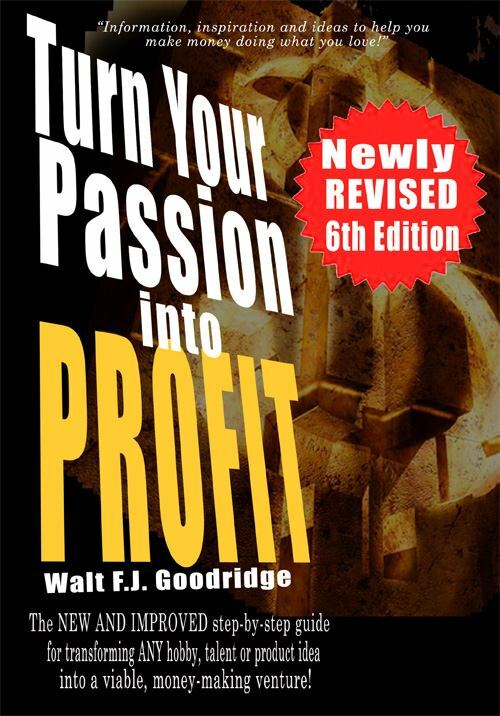 Turn Your Passion Into Profit by Walt F.J. Goodridge. You are about to enter a new world! This information can be applied in N America, UK, Africa, the Caribbean, Europe, Australia and Asia! BONUS! 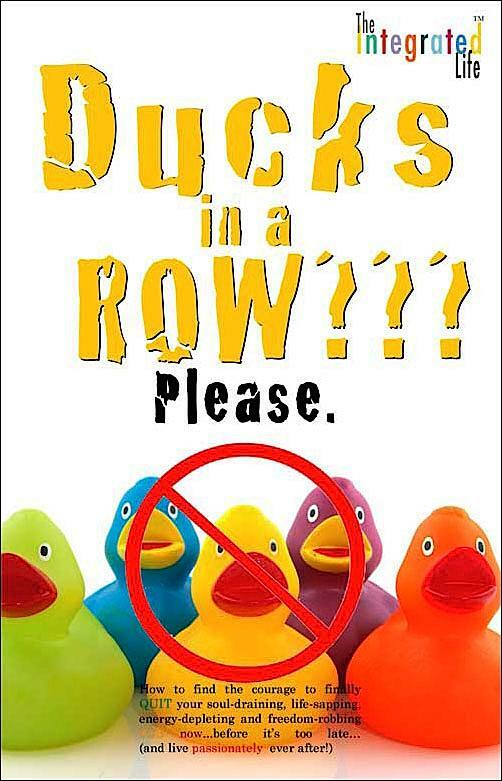 Order now and get Ducks in a Row??? Please. How to find the courage to finally QUIT your soul-draining, life-sapping, energy-depleting, freedom-robbing job now...before it's too late..and live passionately ever after! absolutely free! (a $9.95 paperback value)! See details below. 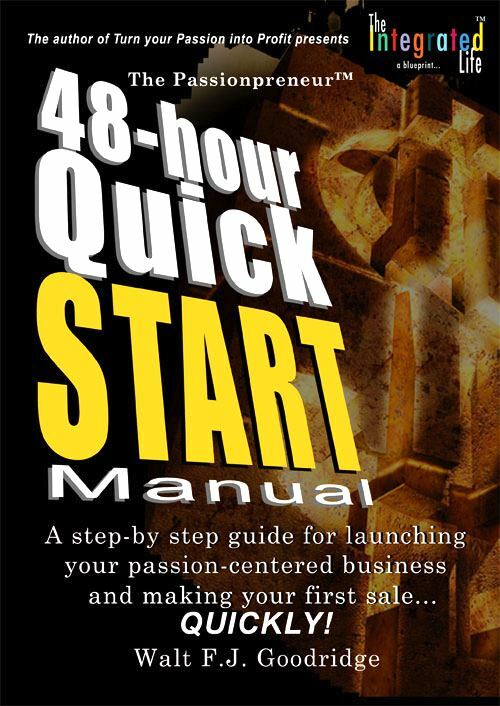 This site features some of the most popular articles about turning your passion into profit! The only way to take control of your life, raise your standard of living and move beyond merely surviving is to create your own unique product or service that you offer to increasing numbers of people in exchange for the things of value that you desire. This simple formula applies to countries as well as people. A self-sufficient economy has its own products or services of value to export to the world. Similarly, a self-sufficient individual has something of value to exchange in the global marketplace. That thing of value is based on your natural talent, skill, or interest-in other words, your passion! Your passion is not just any entrepreneurial business idea that makes you money. There’s a big difference between turning your passion into profit, and simply turning a profit. Any business can make you money. And there’s certainly nothing wrong with finding a lucrative business and using it to create the reality you dream of. In fact, if more people would simply do that, the level of happiness in the world would increase tenfold. However, a passion-centered business answers to a higher calling. Even profitable business vehicles will often fail to sustain your interest, and eventually fail simply because they are not meeting your spiritual needs. You may have some success, but may still end up looking for something else later. It's that something else that we seek in this chapter. A passion is also NOT someone else’s idea of what you should be doing. Even though you can and will use other people’s observations about your talents and strengths in figuring out your passion, the final choice should be something that you decide is important to you. "My dad thinks I'd make a great doctor" is not a valid reason to pursue that profession. A passion cannot be an obligation or someone else’s vision for you. It must be yours and yours alone. It's time, however, to think outside the box. As you search for your passion, don't make the mistake of simply trading one form of employment for another. While it's true that some jobs may be more satisfying than others, and that you can get degrees of fulfillment from various forms of employment, what we're doing here is something completely different. We're not looking for an existing box within which to fit ourselves. We're starting with our dreams, and making our own box from scratch. To live the Passion Profit lifestyle, no resume is needed. There are no pre-qualifications, just your natural gifts, talents and interests. The lack of formal education or degrees will not exclude you as long as you have a willingness to learn. Your desire is the only resume you'll need. In addition, there's no degree required for what you do naturally. Your ability to create the results you promise through your passion is the only validation and certification that others want to see to feel safe buying from you or hiring you. Each choice is a single step in a thousand mile journey. That’s why it’s vitally important to simply head in the direction of your passion, because the journey is the most important thing. Six months from now you may be an entirely different person with different needs, desires and motivations that may require completely new passions to express. Don't be paralyzed by thinking that your decision is written in stone, or that you are excluding all the other things that interest you. You are simply taking the critical first step. . Go forth boldly knowing that you can change your mind and your direction at any time. The opposite of a life lived with passion, is a life of desperation, misery, frustration and unhappiness. It is a life that appears confusing, chaotic and out of control. It is a life perfectly described by Henry David Thoreau, who said "the mass of men live lives of quiet desperation." So, if you’re experiencing any of those feelings, it's a sure sign that you do in fact have a passion that is seeking attention and expression. 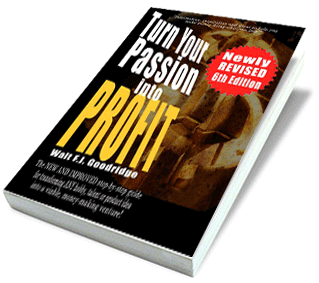 The foregoing is an excerpt from Turn Your Passion Into Profit. Find out more about the Discovery Exercises buy ordering your copy in paperback, e-book, or Kindle/Nook formats below. Considering pursuing your passion? Interested in launching your own business? Setting a challenging life goal? Intent on stimulating a national economy? Congratulations, and best of success to you! I would be remiss, however, if I didn’t prepare you for some of the consequences of the path you’re about to embark upon. If what you are considering is something that will take you to places others are afraid to journey, then there is going to be a price to pay for acting on ideas that go against the norm. In addition to the ridicule and rejection you may face from friends and family, there will also be some cosmic forces at work which may seem to be blocking you. Many of us don’t recognize how the universe works. Here’s an illustration: if you are living in a house and wish to build a bigger better house, it may be necessary to demolish the existing house down to its foundation before you start building anew. In much the same way, once this creative universe we live in gets its orders from you that you want to change your reality, mysterious forces are set in motion that begin making the necessary changes in your life. 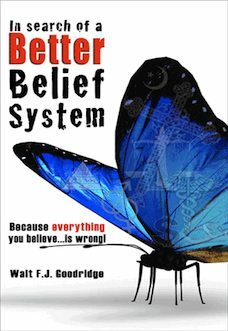 If you’ve been living with people who think negatively and are going nowhere in their lives, you may find yourselves arguing more frequently. Or it may suddenly dawn on you that a person whom you thought you knew, has grown in an entirely different direction from where you now find yourself. You may have to make some hard decisions about who to keep with you on your journey, and who to leave by the roadside. If not, these individuals may hold you back from reaching your dreams. Go on without them, and if later you decide you still want their friendship, you can always come back and get them. Similarly, if you’ve found yourself in a nowhere job, and you wish for the fulfillment and freedom of pursuing your passion, don’t be surprised if things start happening which lead to a (forced or voluntary) separation from your present place of employment. These strange forces which first appear to be creating chaos in your life are part a phenomenon I call "reality reconstruction," and it usually happens right after a new reality is wished for and committed to in a significant way. I witnessed this phenomenon firsthand in one of my business ventures several years ago. Within a few days of signing someone into my network marketing business, some "catastrophe" would invariably befall them. It might have been an illness, a fight with a spouse, a car accident, or some seemingly random event. At first I thought I was jinxed, or worse, that I was jinxing my new business partners. I soon came to realize, however, exactly what was going on: their realities were being reconstructed. We live in a receptive and constructive universe that responds to our thoughts. When you say you want a better life, visualize and set goals accordingly, things naturally start to happen to bring you the life you desire. (Really! It’s true!) What happens, however, is that most people miss the clues, and interpret the ensuing chaos, tension, stress, turmoil, strained relationships, disagreements, disappointments, betrayals and lack of support from those we love as an indication that they’ve made a bad decision. Or worse, they fail to see the connection the new way of thinking is having on relationships and environment, and get distracted putting out these seemingly unexpected, and unrelated fires in their lives. Interestingly, "reality reconstruction" doesn’t affect everyone to the same degree. Some people meet their dreams at a point in life after they’ve gone through the necessary preparation and personal growth. For those people, it can be a smooth transition into their dreams. However, of those it does affect, many fall by the wayside, overwhelmed by the unexpected changes in life, while others see it and embrace it for what it is, a reality reconstruction in progress. The reality reconstruction that ensues by following a passion can mean ups and downs, uncertainty of regular income, having to make late payments, having your lights turned off, having your telephone disconnected, and maybe even homelessness. I recall the months where I was basically homeless and living on my friend’s couch and running my business from his living room. I knew that this was a temporary reality that I needed to experience to get to the success on the other side. Nothing motivates like desperation. And for some of us, experiencing dire straits is the only way we’ll ever develop the inner strength to really do what’s necessary to succeed as entrepreneurs. Are you prepared for any of the possible reconstructive realities that you may experience while you build your life anew? I know of people who say they could never go through those kinds of experiences. If they happen to be married with children, they add that being single would make such changes easier. In response, I encourage people not to let their reason for doing a thing be their excuse for not doing it. In other words, many people crave the Passion Profit Life-style so they can spend more time with their children, but use the "responsibility" of providing for their children as the reason for not taking the risk to succeed. I know of one woman with three children and a husband who quit her high-paying job to pursue her passion of being a writer. She ended up homeless and on public assistance (kids, husband and all) just before her big break--a six-figure publishing contract--came along. She didn’t let the downs get her down, and she realized that all things "come to pass." That is, they have come so that they can pass... (IF you gain the lessons they bring with them). She knew that sunshine follows the rain; that there’s always the seed of victory within every defeat; and that sometimes it’s necessary to hit bottom, before you can bounce back up. So, as we move forward as individuals, as nations, and as a world community; and as we embrace the new buzzword of "change" as the platform of the new leadership, let us remember that change comes with a few challenges of reconstruction. If we are prepared for these ups and downs, we will have a better attitude, more realistic expectations, and consequently a better chance of achieving the goals we’ve set for ourselves!! or seek my comfort in the pain? is a signal change is near! If you believe that the only place your prosperity can come is from your employer, then that’s the reality that you will create. If you accept that your good and all the blessings of the universe come from other sources, and that you can create and receive wealth for yourself from any channel, then you’ll understand that you can make enough to thrive, not just survive! It's a law of the universe that people will pay for the things that have value to them. Reason #2: I don't have the credentials. Most successful entrepreneurs don't have a formal education or degree. If you are faced with a task you've never accomplished before, you don't need to be smart, you simply need to know what to do. Many successful passionpreneurs are simply people who knew the steps to take to go from where they were to were they wanted to be. That's a common fear. You feel this way because you feel overwhelmed by the task. The trick is to make your list of things to do and simply take one step at a time. Yes, and soon the kids will have more expenses, like college tuition. It’s been at least 20 years since one or even two incomes has been enough to meet the average family’s rising cost of living. Rather than working more and more hours to make more money, wouldn’t it be easier to put something in place to decrease your dependence on a single stream of income? Your kids are the reason you want to make money. Don't let them be the excuse you use not to. Again, that’s not a requirement. Many of the most successful entrepreneurs are "idea people" who were simply smart enough to find people who are good in the areas they aren't. If it’s predicted that 97 percent of the population will retire dependent on family, friends and the federal government to survive, and they’re doing pretty much the same thing you are, what assurances do you have that your fate won’t be the same? Besides, no one’s saying you have to leave your job, but why not think about creating something that can create your own pension and benefits. It's my belief that no job can ever match the potential for prosperity of someone with the passion to succeed. Your mission. My mission. Our mission, therefore, is simply to raise your belief level and help you change your self concept so that you actually believe and think of yourself as the type of person who can make money in unique, untraditional ways. Some of the ways I do that in this book is by telling my own story so you can relate, telling others' stories, and by breaking down the entire process in ways that make sense and that resonate as doable. That's why many people have benefited from reading and implementing the strategies in Turn Your Passion into Profit, and why you can too! You can only improve but so much by working overtime, or waiting for a raise or promotion every year. And with each raise in pay, or each increase in responsibility come more demands and an overall decrease in the amount and quality of free time you have available to really enjoy your time here on the planet. Take a passion--something you love to do, something you're good at, something you already have a certain amount of expertise in, something that interests you-- then find the hidden value it has for the public, and then use it as the basis of a way to make money. It's a simple strategy that could be your "plan B" during an economic downturn! Find your purpose. Discover your passion. Create a product. Market it for profit. I call it the Cycle of Success! No matter what YOUR passion is!...and even if you don't think you have one! Cooking? Music? Animals? Skiing? Singing? Not sure? Well, don't worry! Discovering your passion, then uncovering its hidden value is a skill you can master regardless of what your specific passion is or turns out to be. 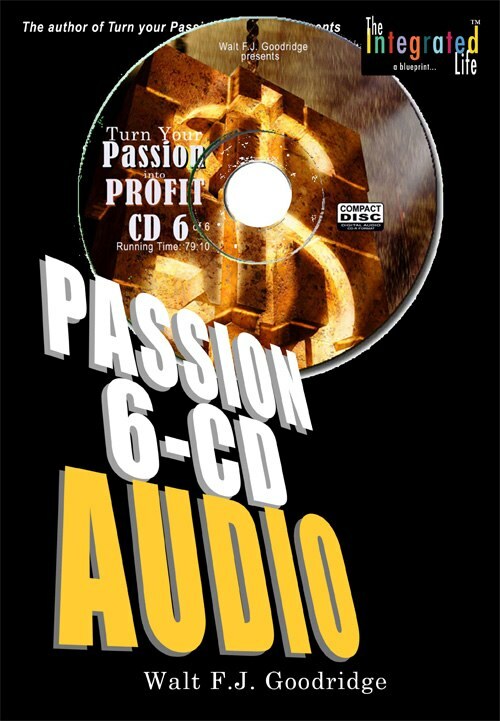 You don't need to buy a book entitled "Turn Your Singing Passion into Profit." This book covers ALL the possible permutations and combinations of purpose and passion and product so you can point yourself in the right direction! I had a client who found herself in that very position. She loved cooking, and was considering starting her own restaurant based on friends' advice. However, I first had her determine she was a "guru" (you'll discover more about that personality/purpose type in the book), and then had her realize that as a guru (here to teach others), that her purpose would be best served by harnessing her passion for cooking and, instead of starting a restaurant, she should instead consider a product or service in which she teaches others what she knows (e.g. cooking school, cookbook, video series, etc.). This is the best way to make sure your business provides you with a higher level of personal fulfillment! You'll learn how to use your passion to help fulfill your purpose, so you don't make this number one mistake that most people make: neglecting to incorporate their purpose into the process. Join my list and get these 3 ebooks below absoluely FREE! 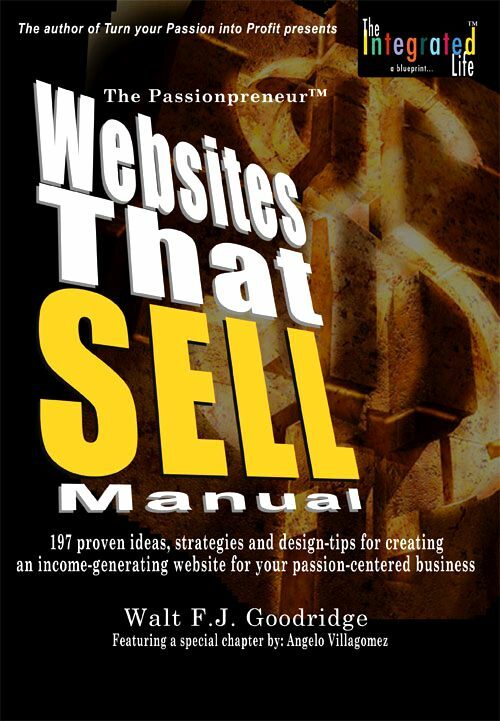 Featured in Jay Conrad Levison's latest Guerrilla Marketing book! 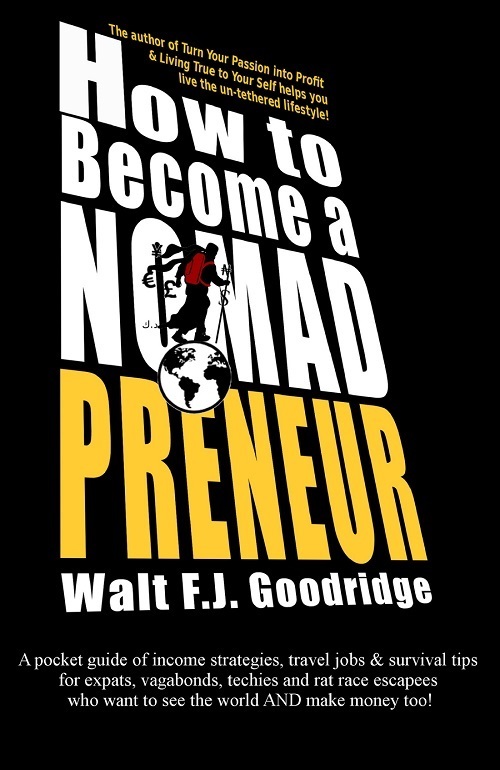 Walt's "passion profit" insights were sought and featured in the new book by Jay Conrad Levinson and Andrew Neitlich entitled The Guerrilla Marketing Job Escape Plan! A prolific writer, Walt has written more than 20 books. 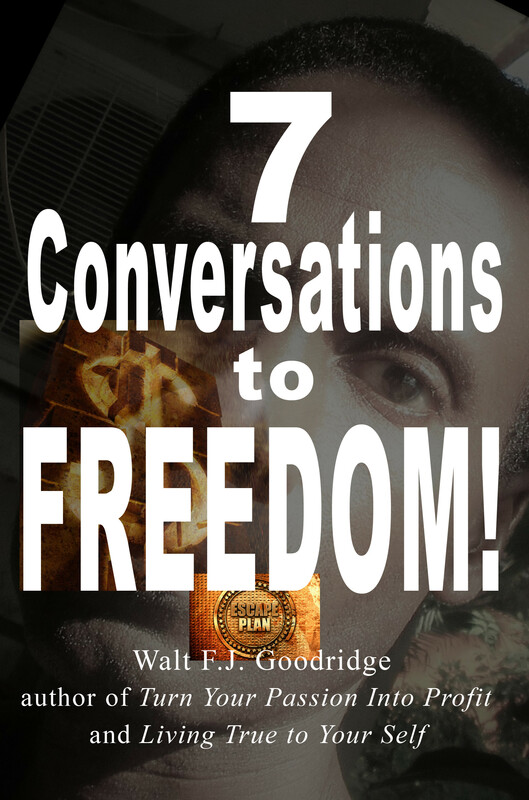 CLICK HERE to view this amazing library available in paperback, ebook, kindle & nook formats!